This post describes how teachers can engage students in interactive, asynchronous on-line discussions. These discussions not only play an important role in online and hybrid classes; but are critical to assuring active participation by students. On-line discussions can also enhance students’ academic performance (Althaus, 1997), and promote higher-order thinking and critical thinking skills when discussion activities are properly designed (Larkin-Hein, 2001). However, assuring that asynchronous discussions are truly interactive is a difficult proposition as students are often concerned with their grades and completing their assignments. Sun and Gao (2016) identified issues with the traditional threaded discussion forums because “the chronological and hierarchical structure fails to show the interrelationships of postings or the importance of threads, which may prevent effective discussions from happening” (p. 73). Therefore, the instructor must use a variety of tools to design the discussion in a manner that compels students to interact with each other (Maddox, 2012; Wood & Bliss, 2016). My research has revealed two important tools for this structuring in an online course. The first tool is the design of the discussion itself. The second is the application utilized to facilitate the discussion. This is true whether the asynchronous discussion occurs in a hybrid or completely on-line setting. The lessons reported in this post are from an on-line disciplinary literacy class with graduate and undergraduate students. This is a collaborative reading activity. That means that you will work with your collaborative reading group in OneNote. You will also keep personal notes in your Collaborative Reading Personal Notes Journal. Go to Chapter 3 of the Kane textbook. Think about how you interact with your textbooks. Do you always read assignments? Why, or why not? Do your teachers actually show you how best to read and use your textbooks? Is it necessary to read the textbooks in order to do well in the classes? Do your teachers know when a significant percentage of students don’t read the assigned material? If so, what is their reaction? Do they do anything about it, or try to find out why the text wasn’t read? Are there consequences? Note/Mark the questions in the group collaboration space that you believe will help you comprehend the chapter and tell your group mates why. This happens asynchronously. The discussion leader will use what you say about the questions to determine 3 to 5 questions you will answer beyond the guiding questions presented below. This needs to be completed by midnight September 30th. Read the chapter individually. As you read, find the answers to your questions, answer the question below, and take notes in your Collaborative Reading Personal Notes Journal create a new journal entry and make sure that you include your responses to the questions from your group citing specific information from the reading and looking for ideas to use in your future classroom as well as personal notes to help develop your understanding of the chapter. Imagine that you are being interviewed for a teaching job in your content area. The search committee, consisting of a principal, a curriculum coordinator, and several teachers, informs you that the school you hope to work in has a policy of using no textbooks! They ask you to surmise what the philosophy underlying this decision might be and ask you what kinds of materials you would use and how you would teach under these circumstances. Write in your Journal, thinking through how you might envision your job and answer your interviewers (Kane, 2011, p. 85). something from the reading that you can use in your future classroom or that you wish you had in school or that made you think about reading in your discipline. After sharing with your group, respond to at least one group member regarding their after-reading posts. Notice that the directions encourage students to engage in multiple discussion opportunities with their peers. The first begins around a pre-reading of the chapter. During reading, the students are working independently in a traditional BlackBoard journal (see figure 1). After reading, students return to their group to share their thoughts and talk asynchronously. The back and forth of the actual assignment around the reading models both the interactive reading process and requires that students share with one another their reading process. It is important that students share their thinking processes because this helps to develop their metacognitive thinking about the content as well as the reading process (Paris & Winograd, 1990, Garrison, 2003; Akyol, & Garrison, 2011). Thus, the design of the discussion facilitates the students as they engage in interactive conversations and helps to build thinking and learning in an on-line environment (Wood & Bliss, 2016). The second tool, Microsoft OneNote, was chosen because it offers students opportunities to move beyond the vertical written asynchronous discussion. In order to facilitate the discussion, the instructor divides the students into small groups and then sets up a notebook for each small group of students. In OneNote student notebooks, there can be pages and subpages to differentiate between sections. For instance, each module can have a page. Then within the module page students can set up sub-pages for before, during and after reading tasks to be completed with the group. On each page, students post into text boxes. They can place their text boxes vertically and horizontally (See Figures 2 & 3). Students can also insert audio comments (See Figure 3). Thus, using OneNote as a tool changes the nature of the discussion from “prompt to response” to “prompt to response to response:” to “student created questions to response to a student to student conversation.” By changing the format of the conversation from a purely print-based vertical format students are able to have asynchronous conversations on-line that more closely mirror a live discussion. The discussion can be viewed with or without viewing the names of the participants. The figure above is an example of how OneNote works with students’ creation of questions. The figures are an overview of an extended conversation. Figure 1 demonstrates students posting their initial pre-reading questions on the left while different group members discuss the questions to the right. As the respond to each other’s posts, they indent or move their statements or questions further to the right. The bottom left of figure 1 is a synthesis of the discussion by the discussion leader. Figure 2 is also a look into a pre-reading discussion around questions. You will notice how students identify questions that they like to the right of the questions posted. Please will also notice that there are two audio posts. The audio posts have student’s thoughts on the questions. The content is similar to the post the written responses. In both figures, you will notice that as students work to finalize their questions for reading they are discussing why they believe different questions will support them during reading with each student going back and forth at least two times before the leader uses the thoughts to develop final questions. The figures of the discussions are just a glimpse of how careful design of both the discussion opportunity and the thoughtful selection of the tool can create a non-linear asynchronous discussion that supports students to develop a careful reading of the assigned text while engaging in a discussion that is interactive and multimodal. Microsoft OneNote offers a way to build student engagement and involvement without some of the pitfalls of traditional on-line discussions threads. Since the discussions are not limited by chronological and/or hierarchical structure, students are able to think through their responses while providing a structure that promotes connecting ideas thus avoiding one of the negative issues of threaded discussions, inefficiency in promoting interactive dialogues due to structure (Thomas, 2002). The move away from traditional threaded discussions allows students to post in a structure that follows more of a natural progression, such as one that would occur in a face-to-face class. Akyol, Z., & Garrison, D. R. (2011). Assessing metacognition in an online community of inquiry. The Internet and Higher Education, 14(3), 183-190. Althaus, S. L. (1997). Computer-mediated communication in the university classroom: An experiment with online discussions. Communication Education, 46, 158–174. Garrison, D. R. (2003). Cognitive presence for effective asynchronous online learning: The role of reflective inquiry, self-direction and metacognition. Elements of quality online education: Practice and direction, 4, 47-58. Kane, S. (2011). Literacy & Learning in the Content Areas, 3rd Ed. Scottsdale, AZ: Holcomb Hathaway. Larkin-Hein, T. (2001). On-line discussions: A key to enhancing student motivation and understanding? 31st ASEE/IEEE Frontiers in Education Conference, Reno, NV. http://fie.engrng.pitt.edu/fie2001/papers/1121.pdf. Maddix, M. (2012). Generating and facilitating effective online learning through discussion. Christian Education Journal 9(2), 372-385. Paris, S. G., & Winograd, P. (1990). How metacognition can promote academic learning and instruction. Dimensions of thinking and cognitive instruction, 1, 15-51. Sun, Y. & Gao, F. (2016) Comparing the use of a social annotation tool and a threaded discussion forum to support online discussions. Internet and Higher Education, 32, 72–79. Thomas, M. J. W. (2002). Learning within incoherent structures: The space of online discussion forums. Journal of Computer Assisted Learning, 18, 351–366. Wood, K. & Bliss, K. (2016). Facilitating successful online discussions. The Journal of Effective Teaching, 16, (2), 76-92. 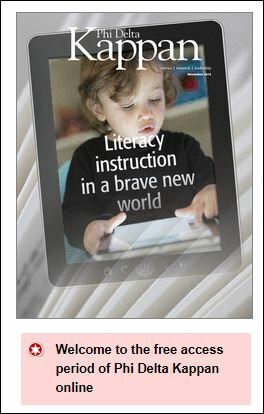 Phi Delta Kappan has just published a themed issue on “Literacy Instruction in a Brave New World” (November, 2014, volume 96, No. 3). For a short time period, you may view and download all of the articles online, for free. We have a lot to learn, a lot to accomplish, and we need to pick up the pace! I found this issue both practically valuable and thought provoking. Please go to the Kappan website http://pdk.sagepub.com/ and search for the current November 2014 issue, or click on http://pdk.sagepub.com/content/current to go directly to the table of contents. I’ve listed the table of contents below (note that Jill has a piece on online inquiry and I have a piece on eText and eBooks). Enjoy! Samina Hadi-Tabassum, Can computers make the grade in writing exams? I’m on the literacy faculty at the University of Colorado-Boulder. Although I try to integrate technology into my teaching in thoughtful and creative ways, I don’t always succeed. Typically, it’s due to lack of time, or the right hardware or software access, or the right know-how! This month, the School of Education received a generous gift of 30 iPads to use in our Literacy Classroom. My immediate reaction: What a fabulous opportunity to explore how the undergraduate reading methods class and I will use this gift over the remainder of the semester. So, in that spirit, my next few posts will focus on how it’s going, what I’m learning, and what I wish I never had to learn! 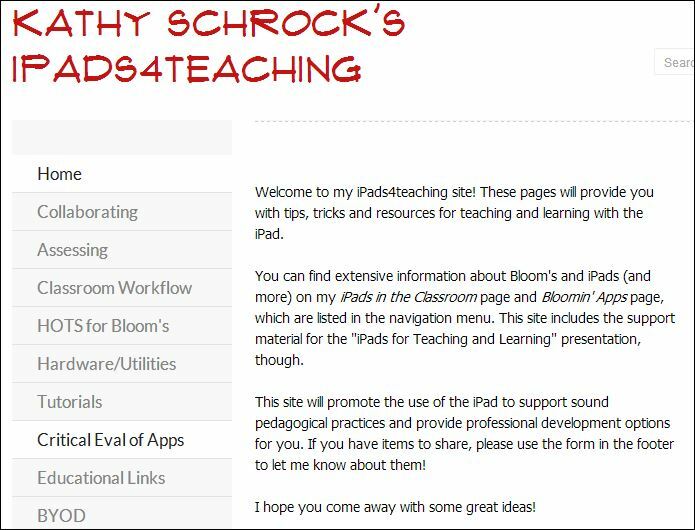 Way back when (yes, all the way back to the 1990’s), I used to consult Kathy Schrock’s website when I had a technology question. I was delighted to find that she has a special website dedicated to all things iPad related! Whether you’re a beginner or novice user of iPads, there are things to learn from Kathy and the many educators who contribute resources and teaching strategies to this site. And, for those of you working with young children, visit the recent posts from Dana Grisham about developing emergent literacy with iPad apps. As soon as we got word that we were going to be receiving the iPads, I immediately began to think about “essential apps”. Our budget was limited, so I knew I needed to be strategic in what we purchased (in a later post I’ll focus on free apps). To begin, I knew I wanted a drawing program to support multimodal composition. I knew that we would be able to use it for responding to literature with color, drawing, photos, and images remixes, as well as creating illustrations for the students’ original picture books and trying out the ‘sketch to stretch’ reading comprehension strategy. 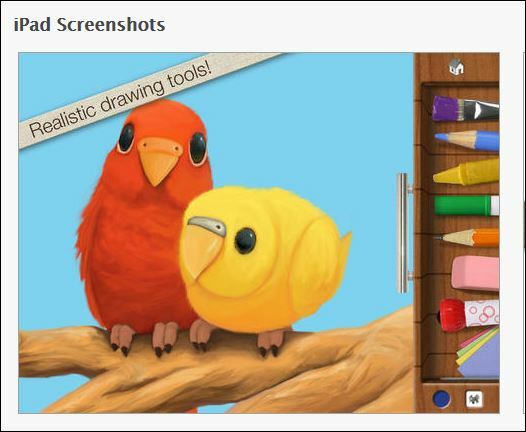 I also wanted the drawing program to be one that could be used in elementary schools, since my goal was that the CU future teachers would first compose with the drawing tool themselves, and then apply it to teaching children. 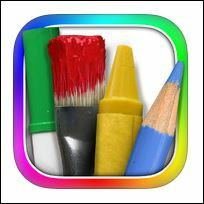 After reviewing multiple programs and getting advice from teachers in our masters’ program, I selected Drawing Pad ($1.99). It’s simple and intuitive, yet allows you to create some pretty amazing images fairly quickly! My second priority was to purchase Book Creator, another composing App that packs a lot of communication potential into a simple, yet powerful tool. I knew my good friend and colleague, Debby Rowe from Vanderbilt University, was successfully using Book Creator with pre-school and kindergarten children. Further, some Colorado elementary school teachers in our masters program tried it out in their classrooms last semester and gave it a favorable rating. 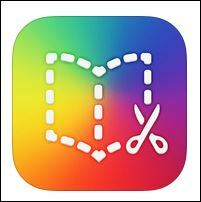 Based on these positive reviews and my own experimentation with a free version, I decided that Book Creator would be a good match for our needs. It was more expensive — $4.99 – but it seemed worth it not to experience glitches that sometimes occur with a free version. So, with 30 iPads and two essential Apps, I am ready to begin the adventure of Ipad and App integration into my reading methods course. I’ll let you know how it’s going next month. I should warn you that I am a PC person. I love my Apple smart phone, but am not nearly as fluent working on a MAC or an IPad as I am on a PC. So, the learning curve will be steep and I’m feeling some anxiety about the process. Ready, set, go! If you have advice, suggested Apps, please post a response. I thank you in advance, Bridget. The nature of literacy is rapidly evolving and these changes demand an expanded view of “text” to include visual, digital and other multimodal formats (Rose & Meyer, 2002; New London Group, 2000; Alvermann, 2002). A richer and more complex definition of literacy requires a complex theoretical framing of the “multiple realities” that exist between educational research and practice (Labbo & Reinking, 1999). Several colleagues* decided to experiment with the pecha kucha presentation style at a session of the Literacy Research Association, December 5th, 2013. What they learned from the session and their ideas for PK-12 classrooms and teacher preparation coursework is summarized in this post of Literacy Beat. Our pecha kucha session used multiple methods united by similar perspectives to investigate shifts in the space and stuff (Lankshear & Knobel, 2006) of learning. Evolving pedagogical models for new literacies and emerging technologies hold “explosive possibilities” (Barab & Kirshner, 2001) for reading and writing spaces. Specifically, these studies examine literacies as cutting across chronotopes of time and space (Bakhtin, 1937) and evolving into “communities of inquiry” in which participants require new knowledge and identities (Gee, 2005). Since the technological advances documented in these studies drove much of the change that we see in information and communication, researchers and educators attempted to answer the important question: How can the use of new and digital literacies in instruction enable “explosive possibilities” for meaning-making and identity construction? These studies examined literacies and digital texts while documenting perceived changes in social practice through the lens of teachers and students as agents of change. Pecha kucha, Japanese for the sound of conversation, is a presentation method in which 20 slides are shown for 20 seconds each (6 minutes and 40 seconds in total). The format utilizes images more than words, keeps presentations concise and fast-paced, powers multiple-speaker events, keeps the interest level up, and gives more people the chance to show. Would you like to hear several Japanese speakers pronounce the term? Click here. Pecha kucha is well-suited for the age of the Common Core and other rigorous standards. The Common Core calls for students to evaluate information from diverse sources, present information in an appropriate style, and make strategic use of digital media. Further, the pecha kucha style requires student presenters to be concise and choose their words and images wisely and well. Students might present pecha kucha via webcast or video (think, YouTube or Vimeo) so that parents and other community members can participate. They may work in small groups around selected topics. Who says every presentation has to be made to the entire class, anyway? The IRA standards for Literacy Professionals call for teacher candidates to employ traditional print, digital, and online resources to “meet the needs of diverse students” and “prepare learners for literacy tasks of the 21st century.” Arguably positioned in one of the most influential roles with regard to the explosive possibilities of digital literacies in PK-12 education, teacher educators must continually model well-considered integration of digital tools in university classrooms. Within the context of a disciplinary literacy course, for instance, professors may choose the pecha kucha platform for in-class presentations in lieu of the tired Powerpoint® platform, especially in cases where visuals are preferable to print text, to effectively encapsulate and express important concepts, terms, or ideas. In this setting, pecha kucha presentations can be posted and revisited on Blackboard or similar course platforms for review. Professors may also invite undergraduate and graduate students to learn and employ pecha kucha to explore and represent basic literacy concepts with digital images and metaphors — and teach them to classmates. Teaching and/learning such “basic” literacy terms (e.g., phonemic awareness, syntax, semantics) through a multimodal digital platform (pecha kucha) may lead to enriched understandings of the ways in which reading involves the coordination of multiple systems including traditional “components” theory of teaching reading instruction as well as sociocultural theories of literacy acquisition. What are the steps to creating a pecha kucha presentation? This website lists presentation steps in pecha kucha format and a template is available there, as well. A few tips for beginners might be helpful to teachers who want to coach their students and minimize frustration. Richard Edwards suggests that pecha kucha can be easily adapted to two-person teams; that is, a 20 slide X 20 second presentation by one student can become a 10 slide X 20 second presentation by two students. He also staggers presentations over class sessions such that no one class session is devoted to a long series of pecha kucha presentations, which, like traditional presentations, can be quite tiring for the audience. Because pecha kucha is image intensive, it is very important that students learn the basic principles of Fair Use and apply them. This post from an earlier LiteracyBeat column may be a good start. Learn more about Creative Commons and how it works to give students and other users the tools to share and use the creative work of others. Similar to pecha kucha, Ignite presentations include 20 slides but they advance at the rate of 15 seconds each (total of five minutes). Some fairly good information about both ignite and pecha kucha are available from Trinity Valley Schools (opens as a PDF). Of course, any presentation in a classroom is an opportunity to learn and a chance to demonstrate what has been learned. Assessment includes the possibility of feedback about content knowledge, processes leading to learning, and presentation, speaking, and listening proficiency appropriate to the grade level. Mr. Holliday designed this rubric as a means of assessing and providing feedback on the pecha kucha format. This university rubric from iRubric takes into account content knowledge and this one, by Danny, is designed with the junior high or middle school audience in mind. Educator Jeff Utecht suggests that participants rate the pecha kucha presentation using a form in Google Docs for quick analysis and feedback. Also on the blog post are additional ideas and a rationale for using pecha kucha. • How do words function to “relay” or contribute to the meaning of an image? • Where will the image be placed in relation to the words and why? • How much of the frame-space will the image occupy, compared to the words? Here is one attempt at pecha kucha by DeVere recreated from the December 2013 presentation at Literacy Research Association. It is not quite perfect (you will notice it is longer than the allotted time! ), I am sure you’ll agree, but do play the video and let us know what you see. What have you done in your PK-12 or university classroom with pecha kucha? W. Ian O’Byrne is an assistant professor of educational technologies at the University of New Haven. Read his blog post on the topic of pecha kucha here. Sue Ringler-Pet works at Iona College, and you can read more about her here. Alvermann, D.E. (2002). Adolescents and literacies in a digital world. New York: Peter Lang. Barab, S.A., & Kirshner, D. (2001). Guest editors’ introduction: Rethinking methodology in the learning sciences. The Journal of the Learning Sciences,10(1-2), 5-15. Bolter, J.D. (1991). Writing space: The computer, hypertext, and the history of writing. Mahwah, NJ: Lawrence Erlbaum Associates. Choo, S.S. (2010). Writing through visual acts of reading: Incorporating visual aesthetics in integrated writing and reading tasks. High School Journal, 93(4), 166-176. Gee, J. (2005). Semiotic social spaces and affinity spaces. In D. Barton & K. Tusting (Eds.). Beyond communities of practice. Cambridge: Cambridge University Press. Lankshear, C. and Knobel, M. (2006). New Literacies: Everyday Practices and Classroom Learning. 2nd ed. Maidenhead & New York: Open University Press. The New London Group. (1996). A pedagogy of multiliteracies: Designing social futures. Harvard Educational Review, 66(1), 60–92. I’ve been exploring Vocab Vids as an engaging, multimodal approach to vocabulary learning. I’ve seen how students from third to twelfth grade, as well as undergraduate and graduate students, invest themselves in exploring word meaning, brainstorming skit ideas, and then shooting a video to express the word. I was delighted to receive a message last week that led me to the New York Times Learning Network’s blog featuring their Vocabulary Video contest (hurry, the contest ends, Dec. 5!). In celebration of nearing publication of 1000 words in their word of the day blog, they have invited students from ages 13-10 to create and upload 15 second videos illustrating one of the featured daily words. Even if you don’t enter the contest, I recommend that you check out the Learning Network’s post to learn more about vocabulary videos. They feature several teacher blogs and online references that are likely to be helpful in supporting vocabulary instruction. I was happy to see that they also featured my Literacy Beat post, Vocab Vids. If your students post their vocab vids, please let me know. I would love to see them and hear about your process. This year, for the second time, I taught a supervised reading course for California State University, Fresno, as part of their Reading/Language Arts Added Authorization (RLAA) for practicing teachers who want professional development focused on reading. The course, LEE230, requires that teachers learn assessment, diagnosis, and intervention for struggling readers by tutoring a small group of students (or a single tutee) with supervision from the university. In the past, such a course would have been taught in a reading clinic on campus or a supervisor would have visited the teachers in their classrooms. But, as we have noted from previous experience (please see my Literacy Beat post from one year ago at https://literacybeat.com/?s=Qik), actually being present to supervise teaching is not necessary. As I noted in June 2012, “This class was taught in a 5-week time frame, so the pace was intense, and the teachers and I never met face-to-face. Teachers were required to spend 20 hours of tutoring a small group of students. Instead of coming to a clinic, teachers could select the small group from their own classrooms, from that of another teacher, or volunteer in a classroom if they were not currently teaching. All of these scenarios played out during the course.” All of this was true this spring, too, although Dr. Glenn DeVoogd arranged for a new tool to be used, called YouSeeU. 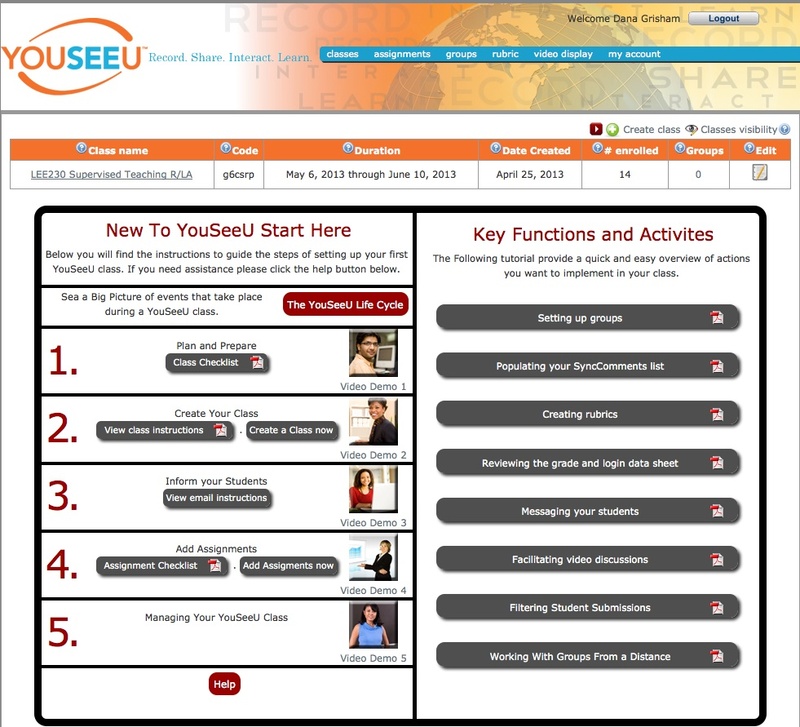 My introduction to YouSeeu (http://www.youseeu.com/) was a personally conducted orientation to the system by Josh Kamrath in a webinar. Josh was also available for problem solving (very few!) during the class. The home page provides information about the system, which—like QIK—was a free trial for this experimental course. The screen capture below gives you an idea of the website and there are several videos on the affordances of the website. At Fresno State, in a graduate level course, I used a very simple aspect of the program. Once you clicked on the class, the site took you to another page that provides you with a view of the video and a list of the students and the videos that they have submitted for review. Most interesting is the opportunity of commenting on the videos as they play. 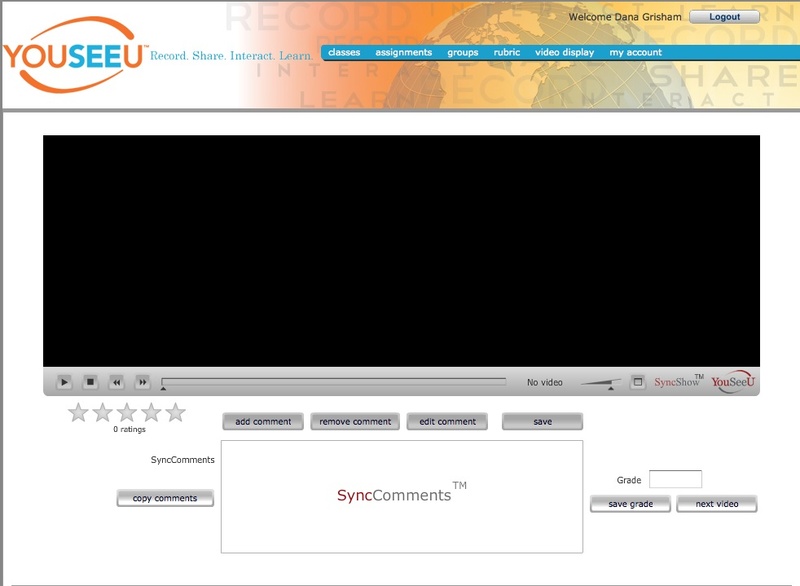 The comments are synchronized with the video, so that the teacher can view the video and see the comments as they arise in response to the teaching. The following screen shot (with names removed) gives you an idea of what the scoring looked like, with options such as archiving. 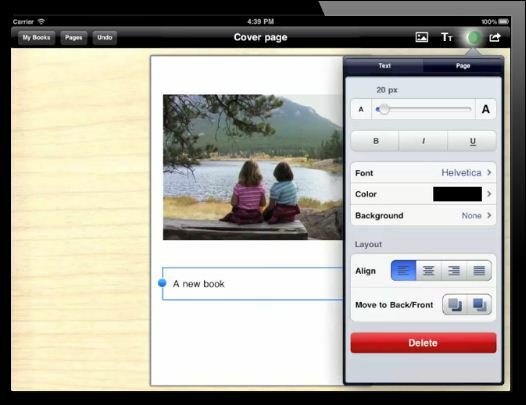 The student can set the parameters for who can view their video. All were originally set so that only I, as instructor, could view them. If I were to do this again, I think I would promote more peer review of the teaching, since teachers learn so much from each other. I hope you enjoy reading about YouSeeU and seeing it in action. The Chief Education Officer, Jeff Lewis, was most cooperative and concerned about confidentiality (very important to them). YouSeeU is a commercial endeavor and the cost is.